Outstanding form at this week’s national championships has led to the selection of six riders from New Zealand’s burgeoning sprint programme in the 15-strong BikeNZ team for this month’s UCI World Cup in London. With three national records and four titles between then, Southland’s Natasha Hansen and Dunedin’s Katie Schofield have earned selection for their second World Cup as they push for qualification for the World Championships. They will be joined by the successful young men’s quartet of Eddie Dawkins (Southland), Ethan Mitchell and Sam Webster (Auckland) and Simon van Velthooven (Palmerston North). 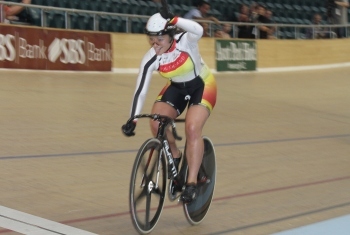 The squad also includes the men’s and women’s team pursuit along with omnium riders Joanne Kiesanowski (Christchurch) and Shane Archbold (Timaru). “The women’s sprint pair has continued to do everything we have asked of them,” said BikeNZ High Performance Director, Mark Elliott. “They have demanded selection on form and they are on track if they continue to improve to qualify for the world championships. They have earned that chance. The world championships is the next big aim for the BikeNZ team, and they will use the London World Cup as preparation towards April’s worlds in Melbourne as well as test out the facilities in the official Olympic test event. “We are definitely keying on the world championships at this stage. We obviously want to ride well in London but the whole focus is using this World Cup as a key preparation towards the world championships. Hawkes Bay rider Westley Gough, who rode strongly at last month’s Beijing World Cup and at Invercargill this week, has won selection over national individual pursuit champion Peter Latham for the final spot in the men’s pursuit quartet, replacing Jesse Sergent who is unavailable with his professional road team commitments. Gough will join the Oceania winning trio of Sam Bewley, Marc Ryan and Aaron Gate, while the women’s trio remains unchanged from the Cali World Cup winning combination of Alison Shanks, Jaime Nielsen and Lauren Ellis. The World Cup squad is expected to be enlarged for the world championships where the BikeNZ selectors are looking to compete in other non-Olympic disciplines. The squad go into camp at Invercargill from today before travelling to London at the weekend. Endurance, men: Marc Ryan (Timaru), Sam Bewley (Rotorua), Aaron Gate (Auckland), Westley Gough (Waipukurau), Shane Archbold (Timaru). Coach: Tim Carswell. Women: Alison Shanks (Dunedin), Jaime Nielsen (Hamilton), Lauren Ellis (Hinds), Joanne Kiesanowski (Christchurch). Coach: Dayle Cheatley. Sprint, men: Eddie Dawkins (Invercargill), Ethan Mitchell (Auckland), Sam Webster (Auckland), Simon van Velthooven (Palmerston North). Coach: Justin Grace. Women: Natasha Hansen (Invercargill), Katie Schofield (Dunedin). Coach Stu MacDonald.